As matrics gear up to write one of the most important exams in their life, a large number of them are facing an additional source of stress – their indecision about what they are going to study next year. “It is important for school leavers in this situation to deal decisively with the issue, as pushing this stress to the back of their minds while trying to focus on their exams will impact negatively on their ability to perform to the best of their ability,” says Dr Felicity Coughlan, Director of the Independent Institute of Education, SA’s largest and most accredited private higher education institution. Coughlan says that learners in this situation will constantly battle the twin stresses of the exams as well as uncertainty about the future, and that this will take away from the all-important focus required to perform optimally when writing their papers. She says that dealing with the issue of post-matric will allow them to direct their energies appropriately, and advises putting aside some time to dispose of the “what am I going to be when I grow up”-conundrum. Look at your subjects and your envisaged results. It is no use shooting for medicine, when you did not take the requisite subjects during your final school years. But it is equally important – even when you do have the right subjects – to be realistic about the level of performance that is required to get in to medicine and to have a plan B. It is also probably not a good idea to look at studying design, when you have never lifted a creative finger in your life. But you would be doing yourself a disservice to not consider design if you are very creative – even if you did not do Visual Arts at school. The connection between school and what you do next is not totally linear. Consider your subjects, your marks, and your interests – those things that make you feel happy and alive – and take it from there. There are countless institutions and courses out there. It is no longer the case that a university degree is the only option if you want a successful career – not only are there interesting options in the diploma and higher certificate space, but degrees themselves are now widely available from registered private higher education institutions that may well offer you an experience more suited to your needs. Many private institutions offer specific additional focus areas such work-integrated courses with the sole aim of equipping you to perform on the job from day one. There are also far more options available today than there were even five years ago – new fields, new courses, new institutions, new opportunities. There is a strong chance that what you have been told at school is based mostly on what your teachers know and experienced, so do your own homework. Once you’ve determined which courses interest you, check to see that you meet the entrance criteria and find out when applications close – it is sooner than you may think. Draw up a shortlist and diarise when the application for each course needs to be submitted, and get them in on time. Make sure you submit more than one application for more than one option to more than one type of institution. Hedge your bets. Then put your concerns aside and focus wholly on doing your absolute best in your final exam. 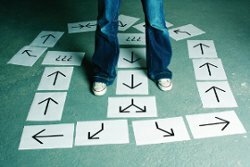 “Although you won’t be worrying about your post-matric direction anymore, the options will simmer in your subconscious, and you will almost certainly, when the time comes, know exactly which road to pursue,” Dr Coughlan says.